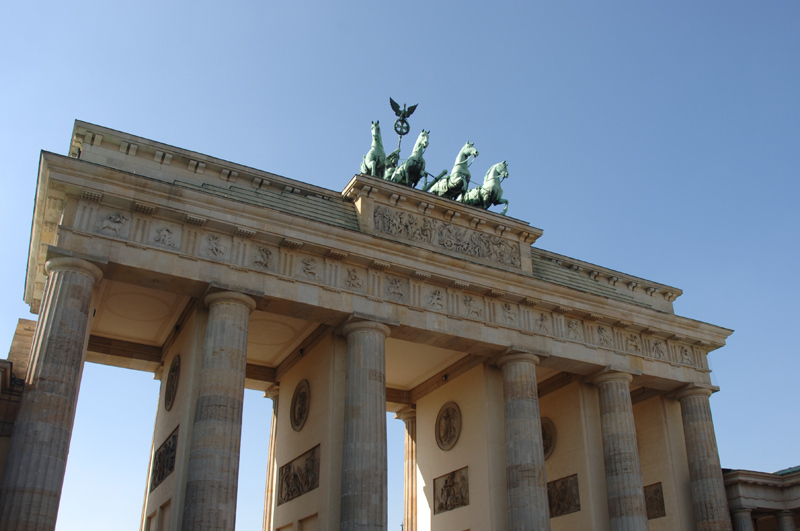 A few metres south of the Brandenburg Gate you will find the Holocaust Monument, built in memory of the Jews murdered throughout Europe by the Nazis. The building’s extensions, solemnity and significance are sure to make an impression on you. Inaugurated in May of 2005, this monument measures nineteen square kilometres in length and forms what looks like a wavy sea made up of 2,711 slightly inclined concrete stars of different height, the tallest of which measure four and a half metres. It was not, however, built just to be gazed at, but to provoke thought and feelings. Visiting the site is an experience. Despite there being no fixed route to follow, you can walk through the narrow lanes between the columns. In reality this enables you to wander around this curious place in the direction you choose. The North American architect Peter Eisenmann, who designed the monument, attempted to create here a sense of desolation, loss and threat. In spite of using a Jewish cemetery as a point of reference, with irregular tombstones scattered untidily around, this site renounces all type of symbolism. The architect struggled for six years to finish the work, and had to deal with various bureaucratic problems as well as the arguments of those opposed to its creation. Even though there had always been the need to build a monument to the Jews who died during the Second World War, this was a controversial project because it required a 27,6 million euro investment from the federal budget and due to its central location, as well as other factors. In addition, the centre also houses a building which documents the horror of the Jewish Holocaust. Its halls display texts and images of Jewish persecution from between 1933 to 1945, as well as accounts from survivors. Without doubt, you will find one of these halls especially moving, this being the ´Hall of Names`, where you can hear a recording in both English and German of the names of Jews who were killed or who disappeared. The reading would go on for six years if the names of all the six million victims of the holocaust were read out. It is possible that you will have to queue to enter the monument due to the high number of visitors it receives and the necessarily strict security measures. In addition, the contents inside mean that it is not recommended for those under 14 years of age.